It isn’t just US or European banks which are shrinking. The nature of this post-August 9, 2007, world is just that – global. Sure, there are regulations which have made investment banking more expensive. But there isn’t a rule or law that Wall Street (really Lombard Street) wouldn’t “discover” a way to circumvent it if they all thought it was worth the trouble. Bond trading, a euphemism for all this FICC money dealing stuff, didn’t need an LCR to look at the world differently. It only needed Bear Stearns. There is only risk where there used to be only return. In an environment where everyone largely agrees (outside of a few outliers) with this returnless risk scenario there really is no other course. Being on the wrong end of such asymmetry leaves only the one long run option. You can fight it and disagree now and again, but that sort of reflationary thinking just cannot last. Goldman Sachs earlier this year announced that it would be cutting back. This week, it was Nomura in Japan (thanks J. Fraser). Once that country’s biggest stalwart in “fixed income”, another way of saying bond trading, they don’t want to do it anymore, either. The biggest question mark hovers over the cuts in fixed-income trading, often seen as a strength at the bank. Nomura is scaling back emerging markets and G-10 rates, foreign exchange and flow-credit trading businesses, as well as costs in the EMEA flow business by 50 percent. Flow trading occurs on behalf of clients, unlike proprietary trading. The business just isn’t there for them to keep up with capacity. Why isn’t the business there? An unstable system destroys not just opportunity but also the incentives to try and stabilize the system. At this point, nothing other than outside influence will break the cycle (and that’s about as likely as a central banker recovery prediction paying off). The Office of the Comptroller of the Currency (OCC) data on Q4 2018 was pretty damning as far as the domestic dealers are concerned. Goldman had an atrocious quarter, no surprise, almost certainly betting on Jay Powell. Money dealers are described in the Economics (and central bank) textbook running neutral books; they don’t, they never have. You can see the ebbs and flows of particular dealers which follow along each reflation episode. Goldman, out of all of them, really bought into Reflation #3. Beginning with the first quarter of 2017, this bank’s derivative book skyrocketed an astounding 33% over the next five quarters! Apparently, they weren’t in much demand for compression trading during 2017’s globally synchronized growth scare, and boy did the world seem much better for it (CNY UP, too). That trend, however, abruptly ended around Q1 2018. Not surprisingly, especially since it was the same trend for the other dealers, too, a lot of bad monetary things have been happening ever since. 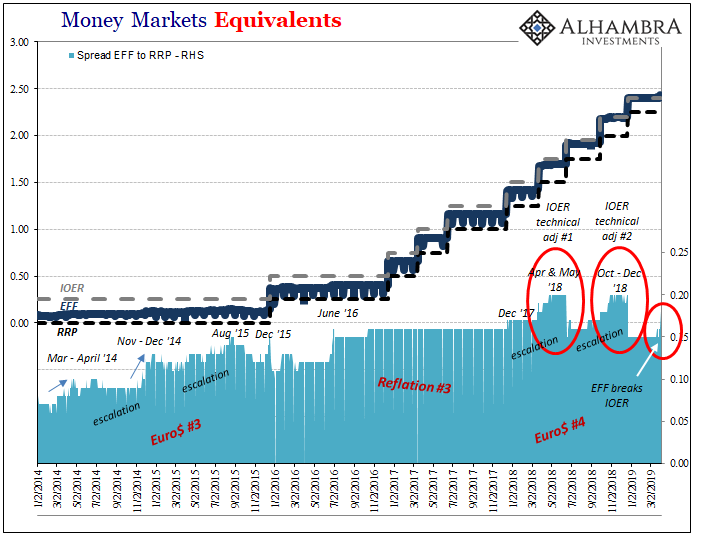 These are the more visible pieces of that “rest of the money markets that do matter” I write about when they intrude upon federal funds, the trouble out there in the shadows which must be severe if it shows up in EFF and IOER (the joke). Since around Q1 2018, yep, intrude they have. 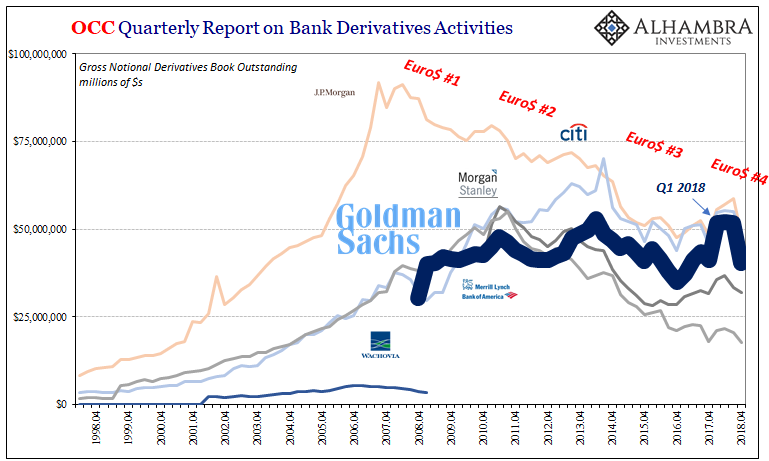 In Q4 when everything was going wrong, GS’s derivative book collapsed 22% during just those three months. Weeks later, the “bank” then announced how it didn’t want to do this stuff anymore. Having bet on Yellen, the bank’s withdrawal helped force her successor to his epic flip flop. The other big banks reduced their exposures during Q4, too. 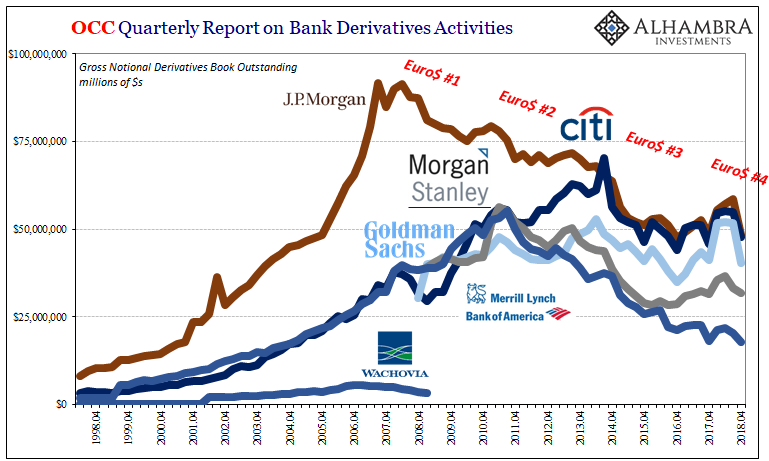 Citigroup, which as late as 2014 right before Euro$ #3 was jockeying to overtake JPM as the money dealer king, ran for the hills in Q4 2018. Its book was whacked 13%. We know the global economy hit a landmine in this same October to December window. Again, it’s not just US banks or those conflicted throughout Europe. This is a systemic problem all across the board, a point driven home by Japan’s Nomura. This derivative stuff, or bond trading and FICC, is the guts of the global money system – a credit-based currency regime. This eurodollar is the world’s reserve currency, its corrosive fingerprints once more all over the global economy. This is one key factor as to why our economic problems are so hard to overcome; how in the world the global economy can lose an entire decade and be one-tenth of the way into another. You start by saying the central bank isn’t central and already people are at best skeptical if not completely turned off. And then you tell them, the few who are left, if you really want any chance at legitimate economic recovery Goldman Sachs [or Nomura] needs to make more money, a lot more, in its bond trading business. And if you don’t want Goldman [or Nomura] to thrive in FICC, then the whole global monetary system must be completely revamped from the ground up. Oh, and by the way, we’ve been operating under a clandestine global monetary system predicated on the world’s biggest banks who aren’t really banks working in the shadows for half a century already. It’s way, way too much to grasp, especially all at once. Real economy participants don’t care one way or the other about formal definitions. They’re stuck with what’s actually available, or not available. The consequences are real, too.